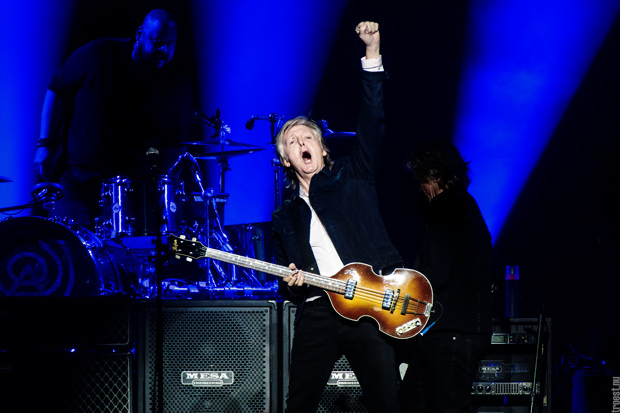 Upon venturing out to Copenhagen's new Royal Arena venue, I start to reflect upon what has triggered my jittery excitement about tonight’s performance by the legendary Paul McCartney. I have reached my third decade in life and it appears to me that my sentiments about McCartney are those of a nostalgic nature. How does a man of 76 years draw evocative emotions out of a person who was born almost a decade after John Lennon’s tragic passing? I believe the answer lies in that the songs of the Beatles (in particular) are pan-generational and somehow continue to appeal to both nostalgia-seeking 60-somethings and millennials alike. And standing in line to the entrance of the arena, I notice that the crowd is indeed a mixture of all ages of adults, joined by teens and children. Tonight’s show is sold out and while Royal Arena is working at maximum capacity, they do so commendably. Tonight’s performance has no support act scheduled, apart from a DJ playing a mix of rock’n’roll jams for mood-setting purposes — nothing extraordinary, but the soundtrack keeps the shuffling around and banter more atmospheric. The stage is flanked by two massive screens displaying a thematic ‘scroll down’ video with pictures and memorabilia from McCartney’s career. 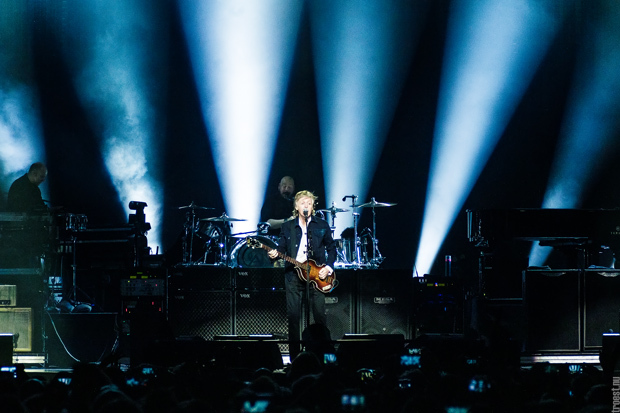 With a runtime of about 45 minutes, the videos begin to make people slightly restless, but at the switch of the lights, we finally see Sir Paul McCartney enter the stage much to the delight of the crowd. The show opens with the rock’n’roll classic, “A Hard Day’s Night”, a tune befitting this cold Friday in November, as McCartney appears in high spirits and in good health. “Junior’s Farm” cues the first entry from McCartney’s “Wings”-era and is followed up by the crowd-favourite “All My Loving”, with a backdrop video documenting the crazed fandom of the Beatles’ heyday. Indeed, the set includes an eclectic mix of the Beatles and Paul McCartney’s solo efforts, where especially his newest album, “Egypt Station”, is showcased through the funky “Who Cares” and the catchy “Come on to Me”. 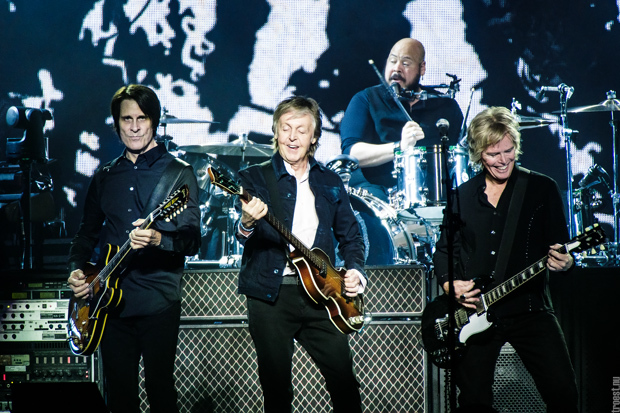 Paul McCartney’s band is, to no surprise, constructed from all virtuoso musicians. I could spend countless minutes describing how good they actually are, but I would rather highlight drummer Abraham "Abe" Laboriel Jr. for his infectious energy and playful manner. He is a truly amicable drummer with strong vocal skills and, as McCartney mentions, “who needs dancers when you’ve got Abe?”. 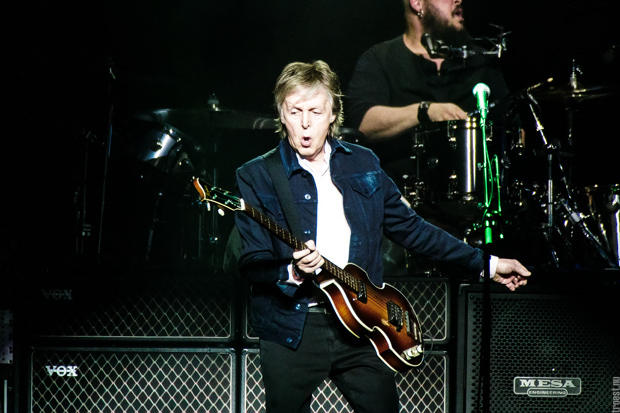 “I’ve Got A Feeling” is one of McCartney's hardest vocal lines to pull off, and it becomes obvious that the age has had an effect on the bellowing skills of the frontman. At an age of 76, I believe McCartney can still sing, albeit in a more moderate expression. Some may disagree with me, but it is still expressive and honest. It is also clear that McCartney does not hesitate to use visual material for his shows. During his tribute to his wife Nancy, “My Valentine” is played to a backdrop of the music video featuring Johnny Depp and Natalie Portman conveying the song’s lyrics in sign language. And “Get You Into My Life” sees the Beatles painted in a Japanese anime style — one of many entertaining elements to be included in tonight’s performance. Within a third of the set, it is the Beatles’ tracks that are the most well-received, with especially “Love Me Do” receiving appraisal. The middle of the set sees the band regroup on the front stage, where they play some of the lighter, more folksy songs. During the tearjerker “Blackbird”, McCartney is elevated onto a separate stage, where he performs a tribute to John Lennon in form of “Here Today”. 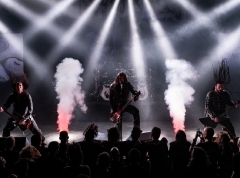 The lengthy set forms a crescendo in intensity, but also in appeal. It is first with the touching Ukulele-strung “Something” and the playful “Ob-La-Di Ob-La-Da” that the crowd really starts to involve themselves in the singalongs. The visual climax of the show culminates in the classic “Live and Let Die”, which sends off guns of fire and sparks in all directions — truly a feat in pyrotechnics and real wake-up call to all audience members dozing off. To no surprise whatsoever, the initial set is sealed with “Hey Jude”, where McCartney does all in his power to have everyone sing along to the famous “na-na-na” parts. He eventually reappears after an encore to satisfy all the Beatles cravings with a full blown medley, from which “Helter Skelter” and “Sgt. Peppers Hearts Club Band” stand as the definitive highlights.